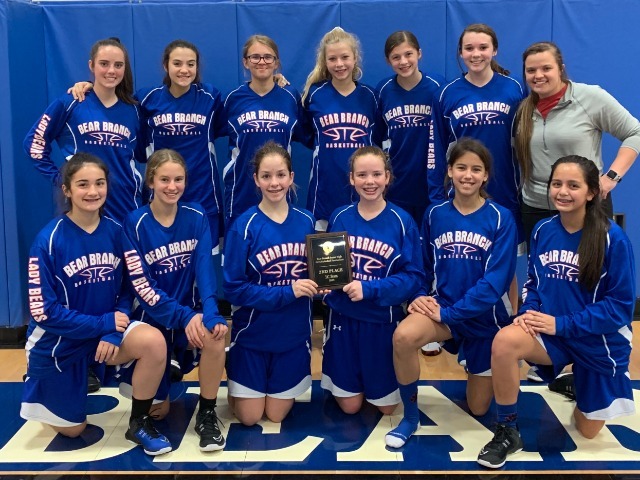 The 8th grade Lady Bears A team took 2nd place in front of the home crowd at their tournament that took place November 30- December 1. The Lady Bears started the tournament by defeating Schultz 38-18. Sydney Holland led the team in scoring with 12 points. Devan Webb contributed 8 points, while Tali Frederick, Carley Welch, and Samantha Granger added 4 points each. Ava Wendinger, Ashlyn Wilson, and Taylor Kathman had strong games defensively. The Lady Bears came back Saturday morning and continued their success by defeating Tomball 24-16, sending them to the championship game. Delaney Sebesta and Sydney Holland led the team in scoring with 6 points each. Madi Holder and Devan Webb led the team defensively with multiple steals each. In the championship game, the Lady Bears fell short 22-25 to Magnolia to end the tournament with a 2nd place finish. Sydney Holland finished with 9 points while Madi Holder contributed 6 more. Angelina Postel and Delaney Sebesta had strong games defensively. Laney Lemen and Carley Welch were strong forces under the basket grabbing multiple rebounds each. The Lady Bears will play at home against Tomball Jr High on Thursday December 6 at 6:15.